These two instruments, attributed to Christoph Schissler, are variations on the Jacob's staff which takes its name from its presumed inventor Jacob ben Makir or Profatius. 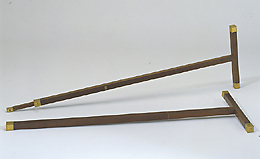 Unlike the original model formed by a cross-rod that can slide along a longer rod, these staffs present a cross-rod which is fixed to the end of the longer rod. The latter contains a third, thinner rod, which can be used as an extension. The two orthogonal rods represent, respectively, the base and height of a triangle of which the visual rays of the observer form the remaining sides. By means of these elements the instrument allows all celestial and terrestrial distances to be measured. The two instruments were brought from Germany by Prince Mattias de' Medici in 1635.